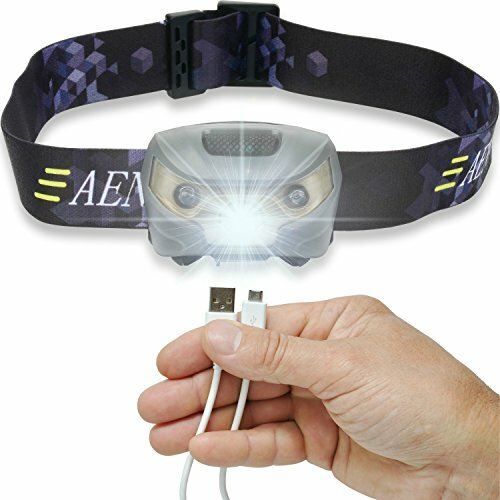 Handsfree USB Rechargeable Headlamp Flashlight - LED Super Bright, Lightweight & Comfortable - Easy to Use - Perfect for Running, Walking, Camping, Reading, Hiking, Kids, DIY & More.. ..The sturdy headlamp body tilts up to 60-degrees, allowing you to focus light where you need it. Plus, the 4 light modes ensure you get the exact level of brightness you need for any use through single button control.. The secure and adjustable headband ensures comfortable fit without "bobbing" or "brain squeeze.".. The rechargeable headlamp will fully charge from any USB port in just 4-6 hours and will provide up to 30 hours of constant light on a single charge (USB cable included). Perfect gift for family & friends..